Economy metal hole punch. 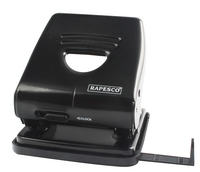 Twin-hole punch for 2-ring binders. Designed for heavy duty use. Sturdy metal construction. Adjustable paper guide. Approx Dimensions (CM): D15 W11 H7.5. Approx Weight (KG):0.6621.